Would you like to hear what folks say about our conferences? 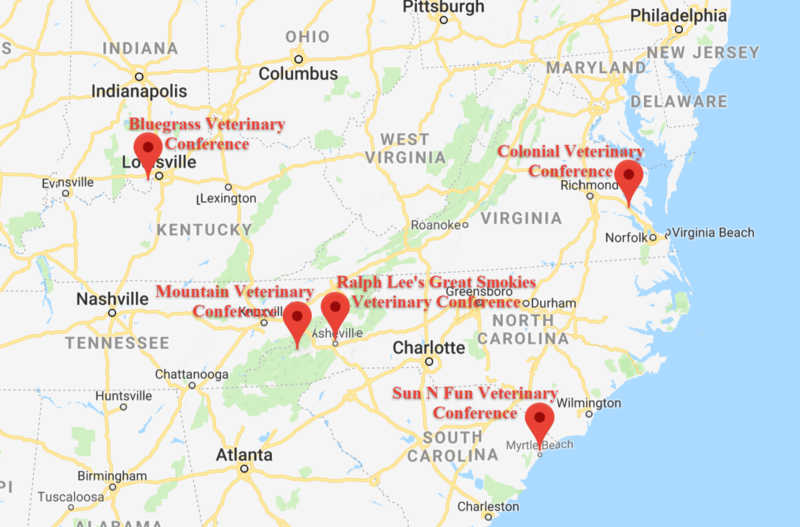 Ralph Lee's Great Smokies Veterinary Conference on November 13-17, 2019 at The Crowne Plaza Resort Asheville, North Carolina. The Colonial Veterinary Conference on November 20-24, 2019 at The Crowne Plaza In Historic Williamsburg, Virginia during the Grand Illumination! Mountain Veterinary Conference : I just attended the Mountain Veterinary Conference and had a great time! The speakers were the same ones you see at the huge, expensive conferences but in a more intimate, affordable setting. The local area is beautiful and lots of fun to explore - I particularly enjoyed watching the elk herds cross the roads in the mornings. The Cherokee Casino was an excellent venue - easy to navigate but with all the ameneties you would expect. The atmosphere is friendly and collegial. The conferences put on by Howie and his family are always better than they need to be and constantly improving! Howie always makes sure to go the extra mile with the "extras" - delicious food and snacks and the welcome reception was to die for! This is not my first conference with Vet Meetings and I'll definitely be back to this or another conference in the future! Mountain Veterinary Conference : I've been meaning to share my very positive review of the Mountain Veterinary Conference for months -- my apologies for not doing this sooner! The Mountain Veterinary Conference was a wonderful CE experience on all levels. There were a wide variety of high quality sessions, the setting was beautiful, the food and accommodations were excellent, and the exhibitors were helpful and informative. The schedule is also well-organized: after a full day of learning, there's time for some local exploration and relaxation. The grounds of the casino resort are lovely, the Blue Ridge Parkway is just a couple of miles down the road, and there are lots of restaurants in the hotel and casino. This is my new favorite conference! 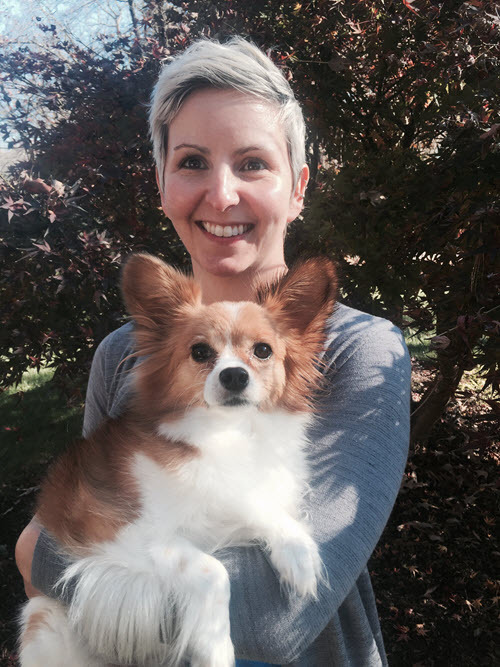 In reference to the presentation by Jenny Cassibry Fisher, RVT, VTS-Oncology at Sun N Fun 2017: I must say I thoroughly enjoyed your presentation yesterday, the Oncology review, FNAs, and going needle free. I am bummed you're not teaching more sessions! You really are such an engaging speaker and kept us all involved and interested. I am grateful I chose to go to your talk, and I will definitely take my "pearls" with me! I hope to see you again next year! Thanks so much! Thank you for having me speak this year at Sun N Fun; What a GREAT show! I have thoroughly enjoyed the kindness and hospitality shown by all. Great organization, great location, and great session topics! I urge all veterinary professionals to attend Sun N Fun next year, and not miss out on this fantastic CE event! Veterinary Association Management conference are intimate and interactive. As a presenter, I have the opportunity to talk about behavior issues – a significant reason for relinquishment, and also how to speak with clients about these concerns, as well as getting pets to vets, including Fear Free and Cat Friendly Practices. Thank you so much for allowing me to speak at this past weekend's Sun N Fun conference in South Carolina. It was a great experience. Howie, Martha, Dawn and the entire Veterinary Association Management team always knows how to make a speaker feel welcomed! The conference was so well organized which is a testament to the VAM team. Thank you so much for all your kindness. It was a true honoring getting to speak to the technicians at the conference. It was a great group who stayed engaged throughout! Thank you again. I hope you are all home getting to relax a little after working so hard to make the conference so successful. I've been a speaker for at least a dozen meetings hosted by Veterinary Association Management in the last twenty or so years. The meetings are always well organized and managed. More importantly, the attendees are always eager to learn and happy to be there. The Lee family and all the staff are welcoming and the atmosphere is very family-friendly. I am always pleased to present at one of their meetings! I've been going to Veterinary Association Management's Veterinary Conferences for 16 years. They are by far my favorite. The quality and choice of speakers always suits my needs. I feel that I get the most up-to-date and thorough information. Lectures focus on practical advice we can actually use - no ivory towers here. The lecturers who they invite are top line specialists, yet always friendly and approachable. Christmas is surely alive in this beautiful town...thank you again! We will be back next year..
My family and I have always enjoyed Veterinary Association Management's (Ralph Lee's) continuing education courses. We have been attending them now for well over twelve years. We are always very delighted to attend the courses and conferences that Veterinary Management Association hosts. The benevolence of the Lee Family always shines forth, and they make my family feel more than welcome. The veterinary courses are extremely relevant to practice, and much of the information obtained can be put into effect the day we return. The speakers are of the utmost quality and are fully knowledgeable of their subjects. Let me not fail to mention the delectability of the food. It is always succulent and plenty to go around. Overall, we absolutely take delight in attending Veterinary Association Management conferences. I have been a veterinarian in NC since 1982. 33years. I have been getting my continuing education hours with Ralph Lee’s Veterinary Management for 28 years. My wife is a registered vet technician and we both must get yearly CE hours to continue our licenses. We have come to Ralph Lee’s Great Smokies Veterinary Conferences for last 20 years. I appreciate through the years the dedication to providing quality continuing education year after year. We enjoy the excellent speakers on subjects that are useful in regular day to day practice; comprehensive wet labs; and very affordable CE. We have always been greeted warmly and are always anxious to return to this meeting year after year. Asheville in October is always a beautiful and fun place to visit and makes CE almost like vacation. Thanks for years with Ralph in the past and Martha and Howie now and in the future. I've participated in several Veterinary Association Management continuing educational meetings and they are all top notch. Each meeting has it's owe look and feel. The one consistent thread is excellent speakers and great topics/content being presented. I will be planning a family vacation around Fun N Sun veterinary conference. It's a must do for anyone looking for good CE and creating great memories with the family. The Center of Veterinary Expertise has had the pleasure of participating in Colonial Veterinary conference on several levels, sponsorship, vendor as well as providing speakers over the last three year. Howie and his team always ensure a positive, warm, and successful experience. We look forward to supporting the Colonial Veterinary Conference for many more years to come. It is not a small thing when gathering your CE credits that the meetings be orderly, well presented, convenient, accessible. Cudos to the Colonial Team. It was an all-around good experience. I have been a equipment manufacturing design consultant for Snyder Mfg. for over 30 years. I have been attending the Ralph Lee's meetings for over 20 years of that time. The Ralph Lee's meetings are different than the standard veterinary conference meetings that are available. The meetings are designed to be very family friendly. The attendees and exhibitors are treated with more respect than any other of the veterinary meetings I attend. The smaller venue will also give everyone an opportunity to build long term relationships in the industry. I plan each year's continuing education requirements around Ralph Lee's Great Smokies Veteirnary Conference. The program venue is especially nice, this time of year, in Asheville, N.C. The Lee family (Howie, Martha and the crew) are most accommodating. They've always made this a pleasurable, meaningful experience. I secure a copy of the conference notes each trip. These notes serve as valuable information for me as I care for my patients on a daily basis. The saddest part, for me, is when the meeting concludes. Soon, I'll be planning for the 2016 conference. The Lees' vet meetings are some of the best...and I attend a lot of them! As both a veterinarian and an exhibitor I get the best of both worlds at these events.... Great Continuing Education and Great attendance to the exhibit booth. I attend every one I possibly can. I have lectured for Veterinary Association Management for the last 4 years and they consistently have wonderfully organized, informative and practical conferences for practicing small animal veterinarians. With a relatively small group of attendees, the lecture material can be tailored to the interests of the group. Small group sessions with interactive question and answer sessions allow for a unique level of one on one teaching that is not present at the larger conferences. The conferences are an excellent value and are paired in locations that allow a nice weekend with sight-seeing or relaxation - CE that is well worth the time away! The nation's leading provider of continuing education for veterinarians, our meetings offer hundreds of hours of lectures, demonstrations, wet labs as well as vendor booths to assist you in providing the very best care to your patients. Now in our 35th year, we want to thank all the speakers, veterinarians, attendees, and companies that make our conferences the most educational and family friendly! © Copyright Veterinary Association Management. All Rights Reserved.